Welcome to Athens Kids Mart & Home Accents! You too can be a contributor (consignor)! It's not too late to sell your items during this sale and then you can get in on special 50% off of black or blue inked price tag discount days. is invited to shop now thru May 25, 2019 but not everyone will get to take 50% off black or blue inked price tags until Saturday, April 27 thru May 25, 2019.
take 50% off black/blue tags on Tuesday-Friday, April 23-26, 2019 from 10AM-5PM. ​It's not too late to sell your items and MAKE $$$$!!! Bring in your items to sell throughout this seasonal sale. Please follow ALL directions on this website to sell your items. YOU MAKE 60% of the price YOU set! easier than a yard/garage sale. March 1, 2019 between 10AM-4PM. ​​See calendar for more dates. 100 US Hwy 72 E.
We're next to the train trestle on Hwy 72. And of course, things for children and babies too. DONATIONS of new and/or clean gently used, clean, unbroken items ACCEPTED DAILY! Please call 256-233-4947 before you donate large items like furniture. Join the Athens Kids Mart & Home Accents email list. We never sell your name and/or info to anyone else and you can always opt-out at any time. ​Please call 256-233-4947 or message us on Facebook at Athens Kids Mart. Hey Facebook users - do a video walk-thru and take a peek at what's inside our store. We have 17 rooms that are wall-to-wall of great things that are priced to sell. ​Click here to find out more about us! Download the sample pdf file of our 2 page flyer (shown below) and print it out. Be a contributor for the 2018 Fall/Winter Seasonal Sale. Find out by clicking the button above. Go West on Hwy 72. 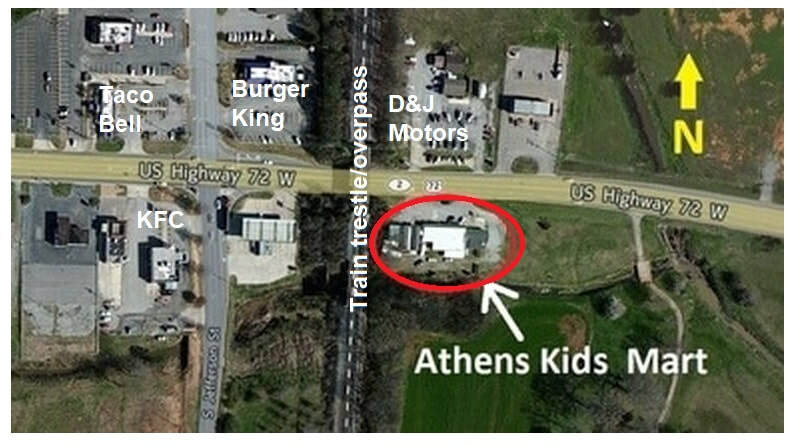 Athens Kids Mart will be on your left (south side of street) just before the railroad trestle. Everyone that plans on being a contributor (consignor) for the 2019 Spring/Summer Seasonal Sale that runs from March 23, 2019 thru May 25, 2019 needs a contributor number. If you were a contributor for the 2019 Spring/Summer Seasonal Sale, you may use that number. If you have forgotten your number, please call 256-233-4947 or contact us via Facebook at Athens Kids Mart or visit us at the store during our operating hours shown in the calendars above or on our calendar page. ​Athens Kids Mart & Home Accents, 100 US Hwy 72 E., Athens, AL 35611. If you are a wanna-be contributor, please contact us for a new contributor number using the phone number and/or Facebook information above to request one. ​We are unable issue contributor numbers via email. You make 60% of the price that YOU set if your item sells. You decide the price. There is NEVER, EVER, EVER a fee to be a contributor. EVER! March 1, 2019 between 10AM-4PM. See our calendar for more dates. You can drop off items (but you must put them in their designated locations) now through the end of this seasonal sale. All items must have a price tag that has the price that YOU set, item description and color, size, and your contributor number. Go to our Tag It page to see the requirements of tagging. When you drop things off in the 2019 Spring/Summer Seasonal Sale, you must sign a new contract for each seasonal sale. Watch your email, our Facebook page and our website for the latest announcements. Go to our Calendar page for more dates and times.